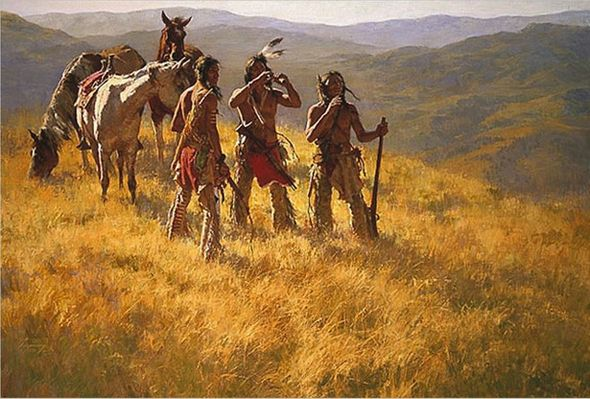 Howard Terpning 90th Birthday Series Limited Edition Canvas Giclee:"Dust of Many Pony Soldiers (w/ Bonus Remarque print)"
Edition: Artist Hand-Signed and Numbered Limited Edition to 90 with 20 AP's. COA. About the Series: Howard Terpning turns 90 on November 5th, 2017! In Celebration of Howard's 90th birthday a special new series of limited editions of Howard's classic works will be released - the Howard Terpning 90th Birthday Series™. Each edition in the Howard Terpning 90th Birthday Series will feature a Terpning work specifically selected by Howard for the Series and will be limited to 90 standard signed and numbered giclée prints on canvas. As a special gift to collectors, included with each canvas will be an identically numbered, high quality 5" x 7" Remarque print on paper of a new image created by Howard that ties in to the featured work. Twenty artist's proofs of both the canvas and paper print will also be produced. Every canvas and paper print will carry a special designator signifying its status as a Howard Terpning 90th Birthday Series edition print.